If not for the irritatingly long loading times, this might well be the best launch title for the PlayStation Vita Sony has in store for us. The feeling of speed still provides a satisfyingly big wow-factor, while the cross-platform options turn this title into a handheld pioneer. A must-have for every Vita-owner. Despite the long loading times (typically 50 seconds before each track) and the excruciating learning curve for non-pros, WipEout 2048 offers a tactically exciting, rewarding and challenge campaign mode with some gloriously-designed tracks and nice variety of events. Some minor multiplayer issues and overly long load times do little to change the fact that WipEout is back in the palm of your hand, and it's better than ever. It may not be the most progressive title of the PS Vita's launch lineup, but it's a worthy addition to its stable. It can be hard to look past the game's technical issues, which include insane pre-race load times and a frame rate that tends to rob the traditionally breakneck hover racer of its sense of speed. Toss in a UI that's a little too slick for its own good and you end up with something a little more ho-hum than you might be expecting. This is when racing dream come true. Speed of the lightning, nice futuristic visuals, music that kicks and well designed circuits that keepThis is when racing dream come true. Speed of the lightning, nice futuristic visuals, music that kicks and well designed circuits that keep you on toes all the time. If you can handle all that adrenaline, take a seat in the ship. I got this game as a part of the PS Plus membership, and I'm really happy with it. The graphics are great, I love the art style, and the musicI got this game as a part of the PS Plus membership, and I'm really happy with it. The graphics are great, I love the art style, and the music goes well with the fast paced racing and combat. It surpasses both the PSP wipeout games in every way. This game was clearly a passion project. Sony's new handheld gaming device arrives in North America next week (or today, for anyone purchasing the first edition bundle). Is it any good? 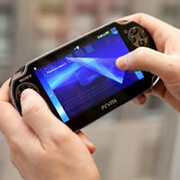 Find out inside, where we survey dozens of reviews for the new PS Vita.